The trip to Darwin was a supreme success! Des did a great job leading the team as they ran skate comps and went into schools. 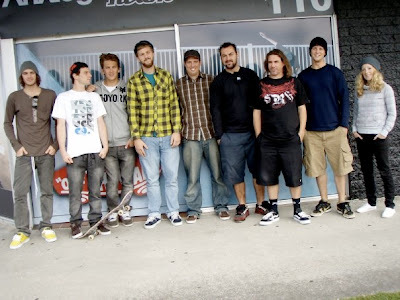 They made great connections with people and God moved powerfully during that time, revealing himself to all the skaters on the team. By the end of the trip each of them had made a step towards God and it's been so amazing to see the transformations that God is bringing about in their lives. I'm already seeing one of them in particular speaking God into the lives of other skaters and his hunger for God is incredible to see. To read more about the trip have a look at Des's blog: desrountree.blogspot.com Praise God for the way He used the Impact World Tour and please pray for all the guys on the team and all the young people that they met up there. Heels on Wheels, the girls skate session continues to go really well, last night sweets and slurpees kept us going for 5 hours, it was so good! The gallery is looking better and better, there are a few key pieces I'm waiting on, then we'll have an official opening and invite the press to come and get it some publicity. We're thinking about selling spray paint and other art supplies in there as well, please pray that God would make His plans for that space clear to me and that I would seek and listen to Him and His visions, not my own. After Wakeskate Wonderland I was offered the opportunity to work a day a week at the cable park on reception and in the cafe which I'm really chuffed about. The managers at the cable are Christians too and I'm looking forward to helping out there and getting to know the staff and riders. Last week a local school chaplain Alan Taylor and his wife were killed in a traffic accident as they helped their daughter fix her car by the side of the motorway. Many people knew and loved them, please pray for their family, children and friends that God would hold them close through this devastating time. I've been praying alot about what I'm doing here and where I should be in the near future. I feel that God's been opening amazing doors for me in the ministry here, and I'm loving what I'm doing and the people I'm connecting with, both on the team and in the skateparks. I have moved my return flight to England to November 17th and will be staying home for a family Christmas (can't wait!) then heading back out here to continue the ministry I'm in. Please do pray that I would be hearing God on His plans for my life and being wise in my decisions. It's really hard to surrender my rights like being close to my family and friends but I have to admit that my life belongs to Him, my choices belong to Him as He made me, saved me, and knows what's best for me. Thank you so much for your continued support, please let me know what I can pray about for you. Des, Fabi, Rob, Derek, Boris, Andy, Mark, Jonno and me.